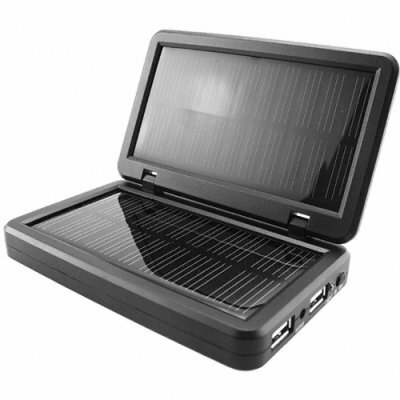 Successfully Added Solar Charger for Portable Electronics - Green Power to your Shopping Cart. Solar charger with battery pack for providing power to all popular portable electronic devices. This well designed dual-panel charger is ideal for the person on the go or anyone planning an extended trip. The CVSCE-7400 solar charger can fully recharge cellphones, IPods, digital cameras, MP3/MP4 players and digital cameras. The recharger's high capacity (2000mAH) internal battery can be recharged by the sun, car power adapter, or a standard AC outlet. Buy in bulk for even better discounts. A perfect item to stock for the solar and electronics accessory re-sale market. It is a good product for emergency situations; if you need battery and you are away from the electricity. I will not reccoment it for charging as difficult charges phone or MP3 player fully, but it is OK for giving you a lot of backup time. For its price is excellent!